The holiday season is in the air and I am made to reminisce about my days of spending the holidays at my father’s village. To my foreign readers, the village is simply the country home where my parents were born and raised. It wasn’t always mandatory to spend the holidays in the village, but it was one of the most exciting times when it happened. Plus my parents thought it was an authentic way to introduce my siblings and I to our culture and extended family members. My dad almost always had a goat or some chickens killed once we made it to the village. And my uncles would come around, and by tradition, they shared the offals, tails, and legs of the goat/chickens amongst themselves. Each family got their share of the meat according to how old they were i.e. by the order of seniority. After the goat was slaughtered, my cousins and brothers would dig a small hole or using an iron basin; they would make a make shift outside barbecue grill on which the butchered meats were roasted. Sometimes, they would even cook some offal pepper soup on the grill with scent leaves to boot. It was probably the most delicious pepper soup I had I ever had. Maybe because it was done with my extended family around and maybe because food tasted better when the family came together. For this recipe, I tried it using two different methods. I did a slow cooked version in my crock pot and I did another easy method on the stove top. The first time I tried the crock pot method, I was getting ready to go out with my ajebutters and I really needed the soup done at a particular time, so I threw everything into the crock pot and it was too good! It had this rich dark color, the flavors were intense and the meat was very tender. For my stove top method, I simply took my time to cook the meat; then I added the ingredients at different points during the cooking time. It came out simply delicious too. These two cooking methods have never failed me; hence my excitment to share the recipe. It’s Christmas and for those who want to spend a more quiet time with their families, the crock pot method works for you and for those who don’t mind, the stove top method is also bae. I apologize for my being unable to share my Nigerian peanut stew recipe. I hope this will suffice for now. Tis the season for great flavor! Happy Thanksgiving and a Merry Christmas! 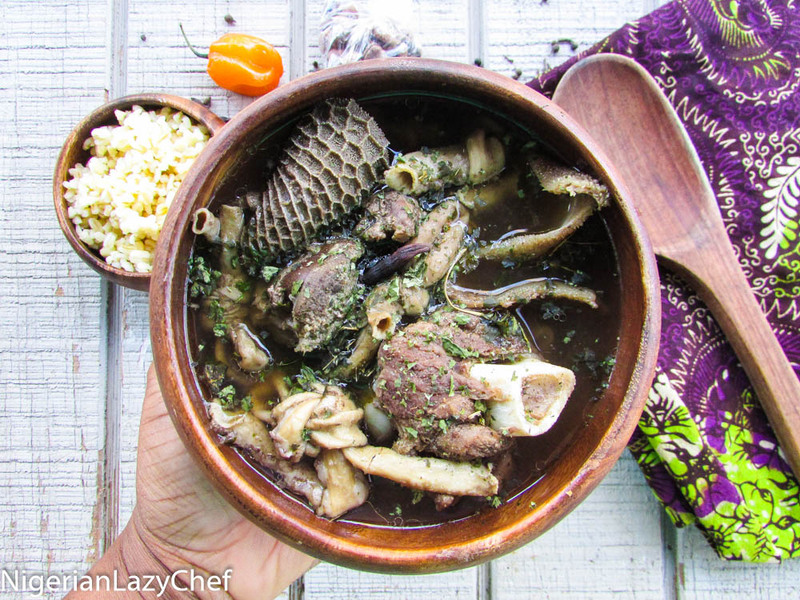 wash the goat meat and thoroughly clean the offals(you could boil the offals slightly in hot water and rinse). Season and rub the meat with the ingredients listed except for the basil. Pour the meats into the slow cooker and let it marinate for 10minutes to 12hours. Pour in water to the level of the meats or slightly above. Adjust seasonings; then plug in your slow cooker and let the soup cook on high for about 3hours without disturbing. If using a lower heat, please cook for longer. Once the soup is ready, stir in the basil leaves and serve. Wash the meat thoroughly(slightly boil the offals and thoroughly rinse). Season the meat with 2 tbsps. of the pepper soup spices. Add the habanero, rub in some salt, bouillon, and oil. Set aside to marinate for about 10 minutes to 12 hours. Pour in water to slightly above the level of the meats. Add the remaining pepper soup spice, onion and ginger. Check for seasonings and bring to a boil. Add yam at this point if using. Cook until the meat is tender. Check for seasonings again, Stir in the crayfish and basil. cook for another 3 minutes and serve. Pepper soup spices are usually made up of uda(remove seeds, roast bark and slightly pound), ehuru(Jamaican nut meg), and sometimes uziza seeds. on lazy days, I use the already blended mix. You could also add a pinch of utazi along with the basil when using the boiling method only. 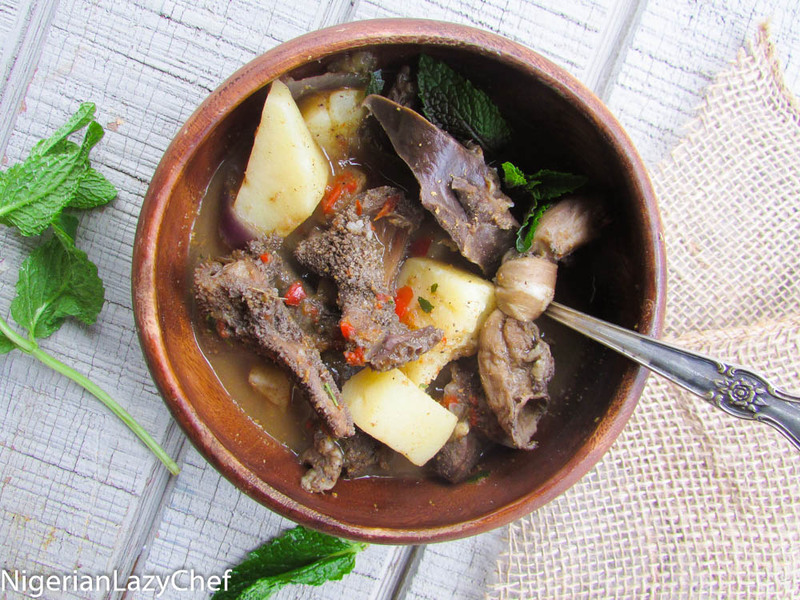 Utazi has a very strong flavor; hence using it in the crock pot method could alter the taste of your soup. 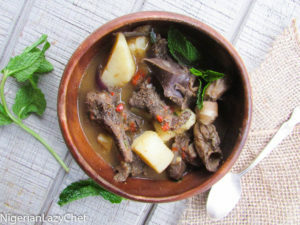 This entry was posted in Christmas recipes, gluten free nigerian recipes, Gluten free recipes, Goat Meat, Healthy Holiday Recipes, Holiday recipes, Nigerian soups, Pepper soup, Peppersoup, Soups, Uncategorized and tagged goat meat pepper soup recipe, Nigerian goat meat pepper soup recipe, Nigerian pepper soup recipe, tripe pepper soup recipe. Don’t know if I have access to offal mix. Even though it is called pepper soup, you still want to be able to taste and enjoy the recipe itself. I’m not for sure what you’re responding to. But each person’s taste bud and tolerance for pepper varies.